German umbrella giant May have unveiled that they are widening their selection of LED bars, to include even more colours to brighten up your outdoor space. Previously you had the option of RGB colours or warm white LED bars, however there is now the option to have both in the same bar, making the system even more diverse. What’s more, these new RGB-ww bars are available at no extra cost. These new LED bars are even able to be controlled via an app. 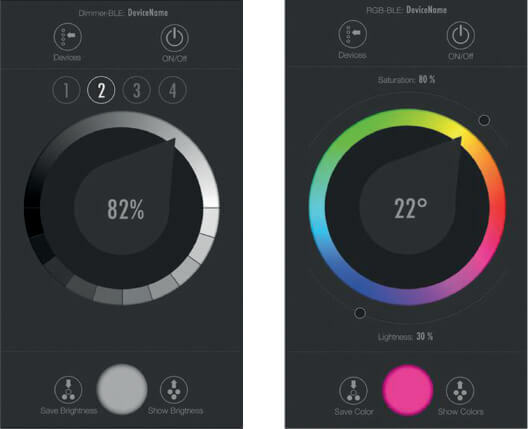 You can even combine different colours and even save various colours, patterns, combinations and brightness levels. The free app for the transmitters (operated via Bluetooth) is available for download on the May website. The new RGB-www LED bars can be controlled by an app as well as a hand-held Bluetooth remote control sender. It is recommended to use the app however, as the Bluetooth sender limits it to controlling two parasols maximum. The regular white LED bars are also still available. For more information, please call us on 0800 328 6250.